IGNY, FRANCE -- (MARKET WIRE) -- December 1, 2005 -- ARCHOS™, the global consumer electronics manufacturer and leader in portable digital entertainment solutions, today announced an agreement with CANAL+ Group, France's largest pay-TV provider, to offer CANAL+ and CANALSAT subscribers new portable entertainment options using the ARCHOS AV 700 Mobile Digital Video Recorder. The partnership extends ARCHOS's innovation as the leading company providing portable video solutions in the pay-TV industry, with agreements with EchoStar Communications Corporation and its DISH Network™ satellite TV service in the U.S. and CANAL+ in France. CANAL+ Group introduced this new model of AV 700 to its subscribers last week in France. A first in Europe, this new technology allows CANAL+ subscribers to schedule and record up to 30 hours of their favorite TV shows and movies in high quality(1) directly from the Electronic Program Guide(2) with one simple click using the remote control of the set-top box. Subscribers can then enjoy watching recorded content on the 7-inch widescreen LCD display wherever they go, or display content back to a TV. Through the partnership, ARCHOS and CANAL+ Group will introduce the AV 700 CANAL+ CANALSAT mobile DVR as a co-branded portable home cinema marketed exclusively to subscribers of CANAL+ Le Bouquet and CANALSAT. "This marks the second major pay-TV industry agreement for ARCHOS, whereby our products integrate seamlessly with DISH Network and now CANAL+ and CANALSAT set-top boxes for recording content directly onto the AV 700," said Henri Crohas, ARCHOS chief executive officer. "With ARCHOS devices, pay-TV subscribers can experience an extremely simple way to record any content from their TVs and watch favorite programs wherever they go. We are thrilled to partner with two of the leading pay-TV operators in the U.S. and Europe to put their programming in consumers' hands for viewing anytime, anywhere." ARCHOS offers various types of solutions for recording and transferring content from TV directly onto a portable home cinema to enjoy on the go. Depending on a pay-TV operator's specific set-top box configuration, ARCHOS can provide customized technology for one-click recording of content from an Electronic Program Guide with automatic recording and naming of the file with the original program title, as with the AV 700 CANAL+ CANALSAT from CANAL+ Group. Another possibility includes the ability to make secure high-speed transfers of encrypted recorded digital content directly from the hard drive of a DVR set-top box using the USB 2.0, as is the case with the PocketDISH from DISH Network. These solutions apply to any category of set-top-box, satellite, cable, IPTV, or terrestrial (DVB-T). They complement the built-in scheduler of ARCHOS's portable devices, which control a large variety of set-top-boxes and VCRs using Infra Red to schedule and record programs. ARCHOS is a global consumer electronics hardware manufacturer and is the technology leader in the field of digital portable entertainment solutions. 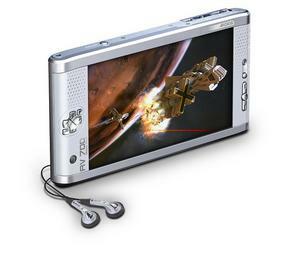 Committed to the most innovative technology, ARCHOS offers award-winning digital pocket-sized products that feature audio and video recording, photo viewing, gaming, as well as other multimedia and productivity applications, for the enjoyment of the most exciting entertainment anywhere, anytime. ARCHOS has offices in the United States, Europe and Asia. More information is available online at www.archos.com. (1) On average based on a 40 GB hard drive and video encoded in MPEG-4 at 2000 kbits/s, optimized resolution for TV viewing. (2) Only with a MEDIASAT set top box.